• To make the gremolata—In a small bowl, mix together the parsley, lemon zest, and garlic. 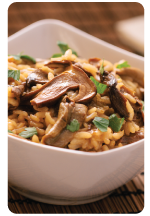 • To make the risotto—Soak the porcini in the hot water for at least 30 min. Strain the liquid through a fine sieve and reserve. Chop the porcini into small pieces. • In a large sauté pan with straight sides, heat the oil over high heat until shimmering but not smoking. Sauté the sliced fresh mushrooms until they release some liquid and are browned, about 5 min. Stir in the porcini and the reserved liquid, scraping up any browned bits. Season to taste with salt and pepper. Transfer the mushrooms and liquid to a bowl. • In a saucepan, bring the broth to a boil, reduce the heat, partially cover, and hold at a simmer. • In the pan used for the mushrooms, melt the butter over medium heat. Add the onion and cook until tender and translucent, 8 to 10 min. Add 2 tsp. coarse salt and the barley, and stir until the grains are coated with butter. Add 1 cup of the hot broth, reduce the heat to low, and stir frequently until the broth is absorbed. Stir in another cup of broth. Once it’s absorbed, add 1 more cup, stirring until it’s also absorbed. Add 2 more cups and simmer the barley, stirring frequently, until it softens but isn’t completely tender and the liquid is almost absorbed, about 10 min. Stir in the cooked mushrooms and their liquid and 1 to 2 more cups of broth. Simmer until the barley is tender, about 10 min. more, stirring frequently and adding hot water or broth if needed. The total cooking time for the barley can range from 30 to 60 min. • Stir in the gremolata and adjust the seasonings to taste. Serve hot. Founded in 1878, this family property has been managed by Paul and Lorette Valade for over 30 years. Originally located in the Castillon-Côtes de Bordeaux appellation, the vineyards expanded into St. Emilion in 2007. On this property, every effort is made to ensure that the wines produced have impeccable quality. Traditional expertise, handed down from generation to generation, combined with long hours of hard work in the vineyards and a meticulous approach to each task, enables the Château to produce outstanding wines from Castillon-Côtes de Bordeaux. This entry was posted in Recipes and tagged bordeaux, bordeaux wine recipe, bordeaux wines, cooking with wine, food pairing, recipe, wine, wine club, wine pairing, wine recipe, wine tasting, winestyles. Bookmark the permalink.